I wanted something relatively quick and easy for tea tonight before we went out for the evening. Spanish Omelette looked like it fitted the bill, so that would be this evening’s meal. I’ve made many omelettes over the years, but never followed this particular recipe. The book is very specific that it should contain only eggs, potatoes and onions, and that adding other ingredients would detract from “the purity of the dish”. I was a little sceptical, but we would see. It really was a very simple thing to cook. First, potatoes are boiled in their skins, then when cool, peeled and diced. 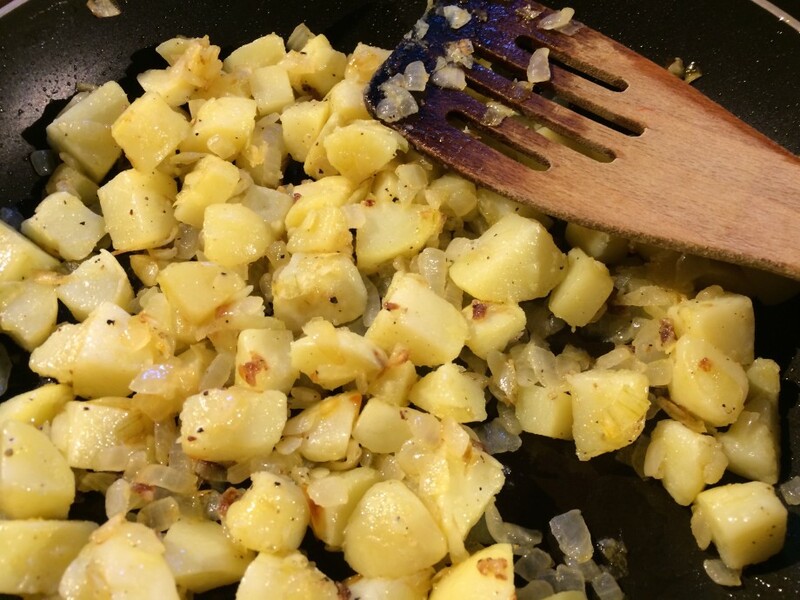 Diced onions are fried gently in olive oil, and once soft and golden, the potatoes are added and cooked for a few more minutes, together with a little seasoning. 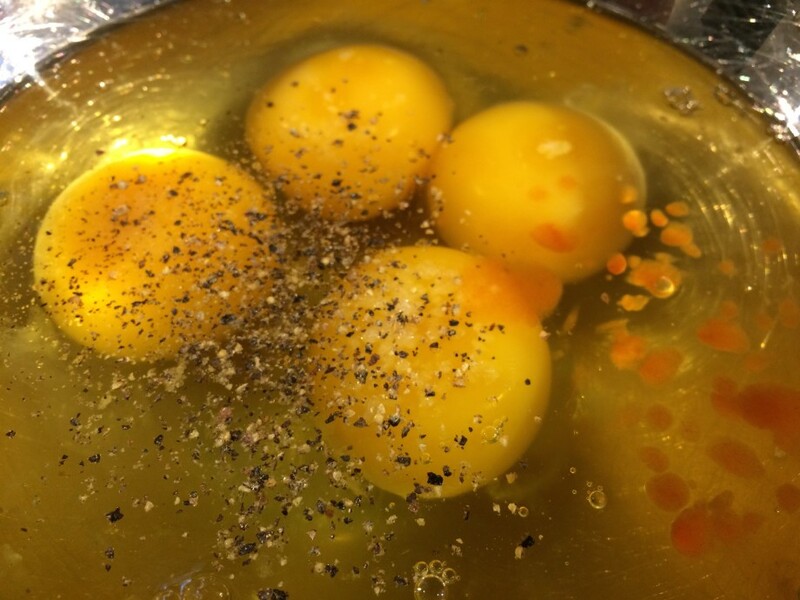 Four eggs are beaten with salt and pepper and a dash of tabasco, then poured into the pan. The onions and potato pushed around a little to allow the egg to get underneath and then left to cook until the base is firm. Then the pan placed under a pre-heated grill for a couple of minutes until the top is puffy and golden. And that’s it. Well, there was one final thing to do. 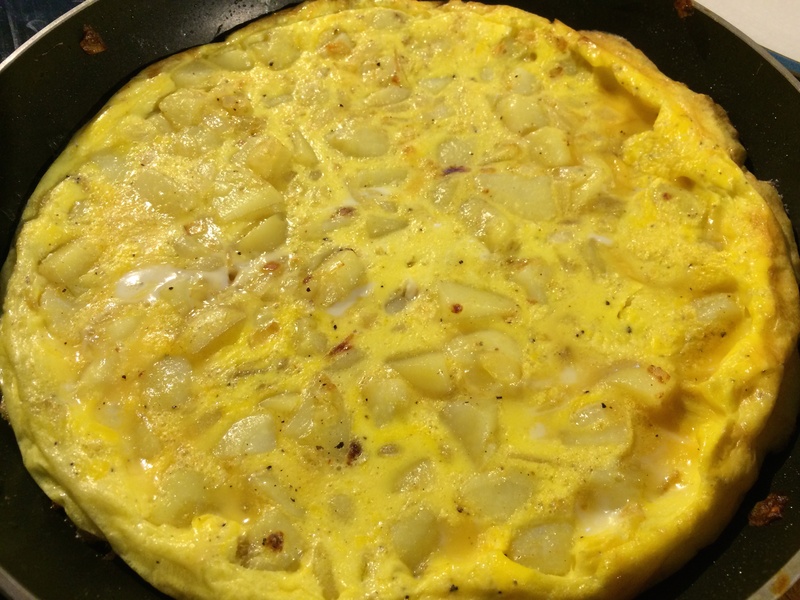 Place a plate over the pan, and then quickly invert it to turn the omelette out onto the plate. I covered the pan with the plate, inverted the pan, and… nothing happened. The omelette remained firmly in the pan. I carefully turned everything the right way up and got to work with a fish slice, loosening the omelette from the base of the pan. I tried again and this time it worked – the omelette fell to the plate, and remarkably stayed in one piece. It tore slightly in one corner where it remained stuck, but it seemed a fairly minor blemish. I served it with some salad, and, as recommended, a fairly unconventional topping of sour cream with chopped spring onions. The whole thing was delicious. 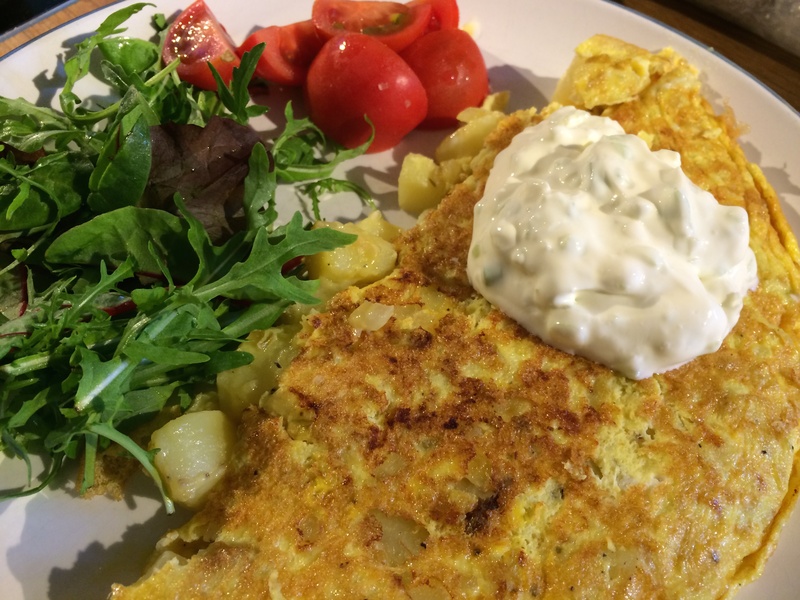 I had thought that only using eggs, potatoes and onions would result in a rather bland omelette, but it had a lovely, delicate flavour. The sour cream went with it perfectly – a good choice there. Very easy to make – it didn’t take long at all, and even left me with enough time to make my blog post before we head out out for the evening. I was a little afraid of this meal because to me it sounded like it would be bland. 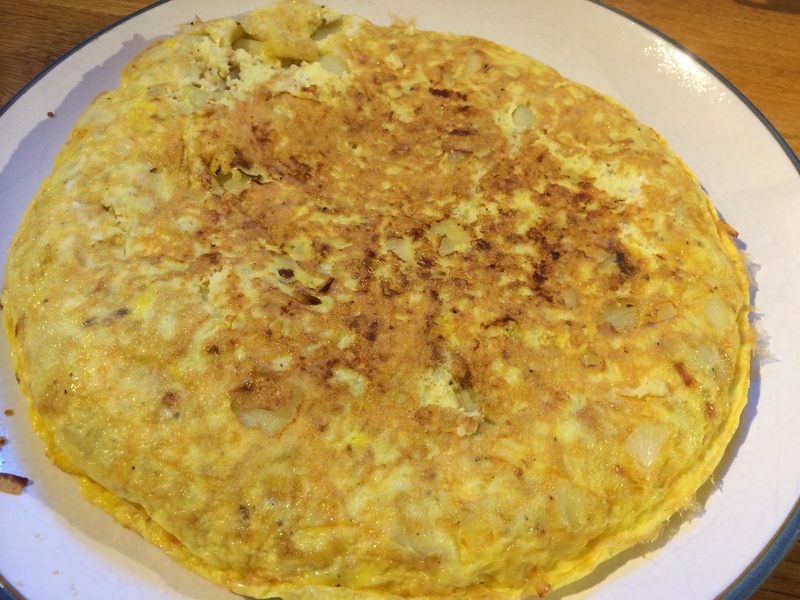 I didn’t realise that a Spanish Omelette only contained eggs, potatoes, onion and seasonings. Not tasty meats or cheeses. I need not have worried. It was delicate and very satisfying. The onion added a sweetness and the potato provided great mouth feel. I really liked this. I would eat it for breakfast or a light meal. We had it with salad and a little sour cream and spring onion relish which went very well. I now know that I need not be afraid of recipes in this book coming out bland. Even the simple, basic recipes are very good. I’ve never tried this for the same reason — it sounds rather bland. But if it works for you, I guess it can work for me. I’ll give it a shot. Do let me know how it works out!